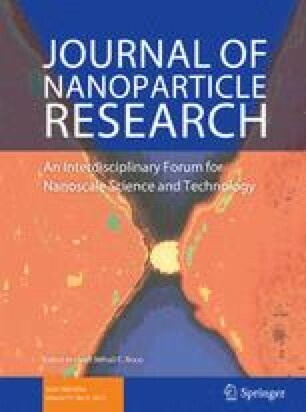 This work presents a new synthesis of mesoporous SiO2–ZnO composite nanocapsules with sizes of 90–150 nm and represents their applications in encapsulation of small biomolecules (fluorescent molecules, drugs, and DNA) for uses in medical biotechnology (e.g., drug and gene delivery) for the first time. The nanocapsule size and morphology have been confirmed through the HRSEM and HRTEM. The mesoporous structure of the novel materials has been confirmed through both BET and HRTEM, and the pore diameter observed to be ca. 2–8 nm with an average diameter of 5.1 nm. The BET surface area of mesoporous SiO2–ZnO was found to be ~230 m2 g−1. Three different types of pores were detected through HRTEM: type-I, normal pores in silica matrix, pore with ZnO nanoparticles at the boundary (type-II) and type-III, the pores with tiny ZnO nanoparticles (~5–7 nm) inside them. To demonstrate the biocompatibility and cell viability of the nanocapsules, normal and cancerous lymphocyte cells have been chosen and investigated in a systematic way. Fluorescent dye (Rhodamine 6G), anticancer drug e.g., Doxorubicin (DOX) were loaded in all types of pores, and EtBr-labeled DNA molecules were loaded efficiently into the mesopores of second and third types of the composite nanocapsules to manifest the characteristic of mesoporous, and to find out its loading efficacy. The release kinetics of Rhodamine 6G and DOX were studied. The results highlight the potential of novel functional mesoporous SiO2–ZnO nanoparticles for using as the carrier of drugs and formation of “SiOZO-plex”, a complex of mesoporous SiO2–ZnO with DNA for gene delivery applications. The online version of this article (doi: 10.1007/s11051-013-1904-y) contains supplementary material, which is available to authorized users. Authors would like to acknowledge the financial support from the University of Hyderabad (UoH) “START of GRANT” (Ref:UH/F&A/2011-12/SG) and UPE-II GRANT (UPE-II/R-10). Dr. Mrinal Bhattachariya (UoH) for providing plasmid DNA, and School of Life Science, UoH for supporting with cell culture facilities and for biological studies.